Two North Twentieth (originally the Bank for Savings Building), constructed in 1962, is a 17-story (264 foot) modern office tower developed by Engel Realty, designed by Lawrence Whitten & Son and constructed by Daniel Construction. It is located at the corner of 20th Street North and Morris Avenue in downtown Birmingham, a site previously occupied by the 1886 L & N Station and before that, the Relay House, a hotel built by the Elyton Land Company in 1871. 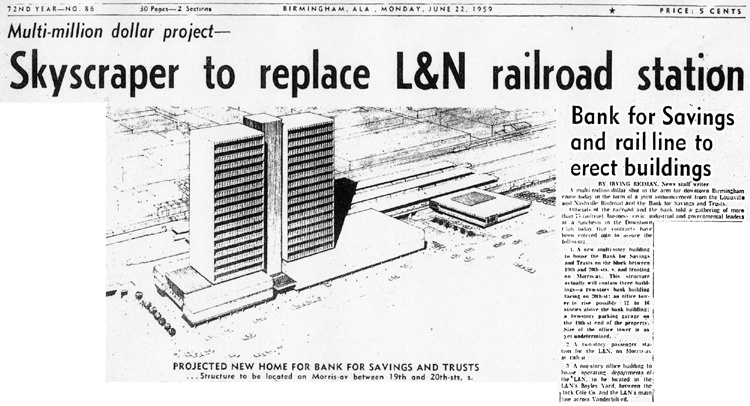 Construction of the $7 million new home for the Bank for Savings and Trusts began in 1960. It was the first tall building built in Birmingham after the Depression, and is the most visible example of the International Style of architecture in the city. The exterior of the building is clad in anodized aluminum panels manufactured by Reynolds Aluminum in Muscle Shoals. The strongly pronounced vertical mullions enclose "equipment flanges" to facilitate cleaning of the gray-tinted glass windows. The structure is known best for the monumental 176 by 26 foot electronic marquee mounted on top as part of the Centennial of Birmingham in 1971. The electronic sign board displayed advertising messages using an array of 1,440 incandescent bulbs. The sign operated intermittently until it was wrapped with a vinyl billboard in 2014. In 1975 the building was used as a location for the movie Stay Hungry. It served as the offices of a fictional real-estate cabal. Several refurbishing projects were completed in the late 1970s and early 80s. During the 1980s Engel Realty Company, which had participated in redevelopment, kept its offices in the building. In 1995 the building was purchased by Randle Jackson and Atlanta attorney Jeffery Hersh acting as Golden Mane Acquisition Inc.. They performed asbestos abatement, but were unable to secure enough new tenants to proceed with planned renovations. In the late 1990s the ground floor of the mostly-vacant structure was occasionally booked for rave parties. In 1999 the building was purchased by Atlanta developer George Cornwell, who oversaw a $16 million overhaul of finishes, infrastructure and security for the building by Evergreen Construction of Atlanta. Cornwell rechristened it as "Two North Twentieth" and the renovation, designed by KPS Group, won a Preservation Award from the Birmingham Historical Society. In 2001 Cornwell re-lit the advertising marquee. The building is managed and leased by Harbert Realty Services. In April 2006 the former Relay House on the 17th Floor served as a gathering place to overlook the site of the future Railroad Reservation Park while plans from Tom Leader Studios were presented to local officials. The building was sold in 2013 for $19 million ($91.35 per square foot) to PZZ TNT Property Owner LLC of New York. Harbert Realty retained ownership of the rooftop sign.